The Bosman 8, was made by "G.Z.E. Unimor" (Gdanskie Zaklady Elektroniczne Unimor) in Poland (Gdansk to be precise). It was released in 1987 as a system for schools and offices, but even CAD/CAM software was developed for this machine and later, as being too expensive (cost 1 300 000 zl) and extremely hard to get (apparently only 1000 models have been produced), Bosman 8 was used mainly as a terminal for automatized processes (designing printed boards). The main particularity of the Bosman 8 is that what you think is only an external disk drive is in fact the computer itself! Yes, everything is in this small box. But it needs to be connected to a terminal and a monitor. 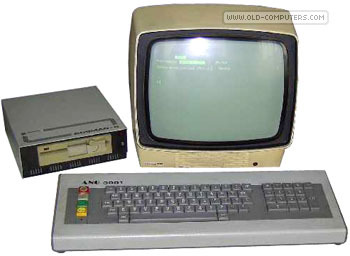 Two keyboard/terminals were available: AN-2001 and ANG-3001, the latter featuring graphic possibilities. Indeed, the Bosman 8 seems to let the terminal manage all the display, hence different display features according to what "keyboard" terminal you are using... In fact it looks like the Bosman 8 was conceived as a system to turn an already existing terminal into a real computer. Two 3"1/2 or one 5"1/4 (200 KB?) floppy drives were built-in the system (max disk size was 800 KB - DS DD according to the manual). The monitor shipped with the Bosman 8 was a monochrome Neptun 159. There were also two more types of 12 ''monochrome monitors developed for it - an "M4902" and a "M4801" that was capable of working with a CGA or Hercules type display. The whole system was apparently available in two colour versions: a bright gray model and dark gray model, but the differences are unclear (anyone can help?). It run on a CPM/R operating system and the manual says it's compatible with CP/M 2.2.
see more G.Z.E. Unimor Bosman 8 Ebay auctions !